You know, I've been reading comics for the better part of thirty years now, and it still surprises me how little Jack Kirby I have in my collection... that is to say original Kirby work. I have plenty of trade collections of his Marvel work, and a smattering of his DC... but, as far as original single-issue Jack Kirby, I have embarrassingly little. When I happened upon this copy of 1st Issue Special, I just couldn't pass it up. I actually had no idea that Manhunter was a Kirby Kreation, much less one with roots in the Golden Age. Join me as I partake in this mid-70's oddity. 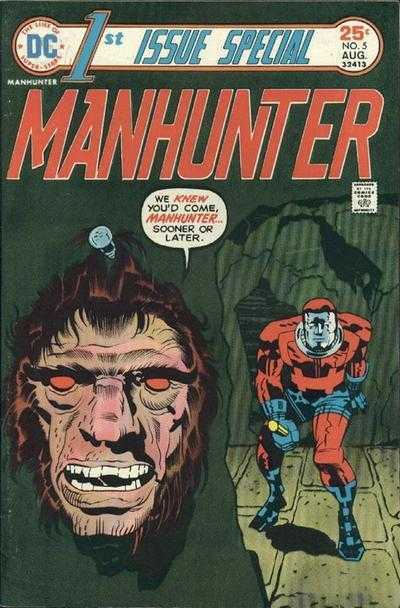 The issue opens as the Manhunter enters the Cave of the Talking Heads. Rather than burning down the house, he makes conversation with them especially the creature that appears to be pulling the strings, Chopper. One of the talking heads attempts to fry our hero with some delicious Kirby Krackle, only to be blasted by the Manhunter's baton. Chopper retaliates by dropping an electrified dome atop the Manhunter's melon. Making a last ditch effort, our man blasts his baton straight at Chopper, knocking off his grotesque mask and exposing his... well, still grotesque... human face. Chopper grabs an ax and makes a beeline for Manhunter. He swings wildly, and winds up hitting the electrified dome... he dies in a kloud of krackle. Manhunter leans back into the cave wall, and removes his own mask... revealing an aged and wrinkled face. He thinks to himself how his time as Manhunter is nearly done, as he soon will perish. We stumbles out of the cave, resilient, though exhausted. Meanwhile, at the home of Public Defender Mark Shaw and his Uncle are annoyed by the injustice they find in that day's newspaper. Mark is upset that he feels powerless to defend the innocent in court. We rejoin the current Manhunter as he approaches the alter of the Grand Master. He again agonizes over his advanced age... he is worried that the Manhunter name will not live on. No sooner does he say this, that the voice of Mark Shaw emanates from the Great Lion... there appears to be someone worthy of the title. We now rejoin the Shaws, as Mark dons the Manhunter armor for the first time. Mark notes that the suit appears to bring with it strange powers. As he readies to go out on his first mission of justice, some thugs just happen to burst in their home. The All-New Manhunter makes short work of the crooks, and interrogates one by hanging him out a second story window. He wants the name of the man behind the attack... it was, Al "The Hog" Beefer... with a name like that, I'd have to figure your career paths are limited. Manhunter checks in with Unc, who has shown he needs no super-powered suit to take care of himself, having taken the thugs' guns and "trussed them up"... maybe he should be the hero of the story. Manhunter sets out on the path of the Beefer by... jumping into some nearby trees. The Shan have been watching the entire ordeal, and feel hopeful this Mark Shaw will be the next true Manhunter. Our story ends with a look at the homely mug of the Hog. Sadly, this one panel would be Mr. Beefer's only appearance. The issue closes with a text piece discussing the Manhunter written by the King himself! I often forget how different comic sensibilities can be. This was, a fine issue... perhaps a bit basic, perhaps a little textbook. Still a neat read, and it was drawn brilliantly. My only complaint is that the entire issue was maybe a bit too convenient. As a set-up issue, it was fine. It's difficult to really judge this as anything but. There really isn't all that much to say. There was some fun action, and I enjoyed seeing the Manhunter as a sort of legacy character. I liked seeing the initial Manhunter as an aged fellow... I feel there isn't enough of that sort of thing in comics... especially of this vintage. If this series were to continue, I'd have liked to see the two Manhunters meet face-to-face. I think there's a fair amount of storytelling mileage there. Sadly, this didn't get picked up... I guess not enough fans wrote in begging to see the Clash between Manhunter and "The Hog"... and so, this one is lost to the funky mid-70's comic book ether. Worth checking out if you're a Kirby Kompletionist, as the King is still kapable of kracking out kuality komics. Stand back... there's an EXPLOSION comin' thru!